Who’s sending all that email…it’s the middle management! This is a pretty simple metric to look at but might be quite revealing to your organisation. I’ve matched the sender of an email to their rank derived from the corporate directory. The rank is their position from the top of the directory e.g. A manages B manages C – if A is at the top of the directory then A=1, B=2 and C=3; this approximates their grade and roughly those ranked 1-2 are senior executives, 3-4 are middle management and 5+ get to do all the work. 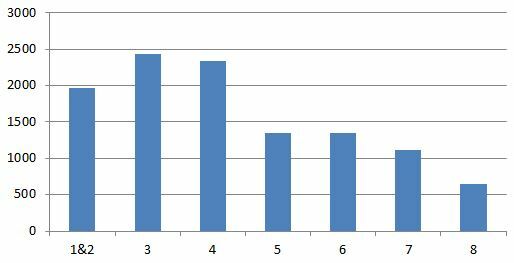 The chart shows the average number of emails sent at each rank over a number of months. Ranks 1 and 2 are combined because rank 1 is a very small sample. This entry was posted in email, Social Network Analysis and tagged Corportae Directory, email, Social Network Analysis on April 29, 2013 by Robert Gimeno. I’ve already discussed the corporate directory when it comes to enriching email data. It also contains information that can help build a picture of the social network. Specifically the line manager relationship is held in a typical corporate directory. If you have imported the directory like I did then there is no more to do as the employee ID and manager ID are already there. I’ve also kept historical management structure relationships on the basis that a line management period will build a relationship that tends to persist. 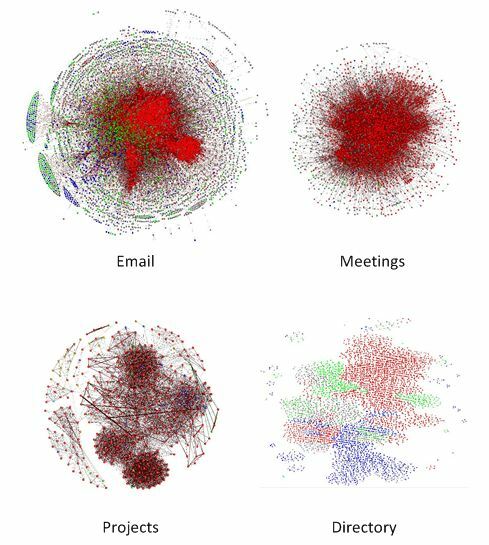 Martin House pointed me to an interesting paper which contains a diagram overlaying the corporate structure (from the directory) with the social network revealed by emails, looks pretty neat, must have a go at creating one. This entry was posted in Social Network Analysis and tagged Corportae Directory, Social Network Analysis on March 21, 2013 by Robert Gimeno.